When I first heard about this movie, I was curious as to what would be the premise of the film. I grew up in the Bay Area so De La Salle’s story was familiar to me. In fact, I was in high school at St. Mary’s (Go Panthers!) when the streak ended. So as I saw the trailer for this movie, I wondered what the storyline would be. In terms of an attractive movie storyline, what could this film offer? A successful team with a great winning streak loses a game. Big deal. It’s just a game. But the movie tries to tell the story of how that it’s more than a game. The streak is meaningless. Rather, the relationships with one another is what matters the most. I met Alexander Ludwig, Stephan James and Matthew Daddario at the screening I went to and got their autographs. They all starred in the film. The movie is about the coach. The entire film was about the morals and values of coach Bob Ladouceur and how despite the trials of his own life after suffering a seizure, he sees the struggles of his players and reminds them that they are a team. They are a family. This is typical of most football movies these days. It’s about unity and family. It was hard for me to put this in perspective given the fact that this team was never the underdog. These were the top dogs. So there was not as much sympathy for the struggles of a king. But this movie does impart great wisdom that most of these sports movies do. And for that, it’s a great film But it’s hard to get over the constant forced storyline in this movie. And if you are a historian of this team, then you know a lot of stories and games were fabricated just to make this movie work for Hollywood. And there was a lot of poor tackling that made some plays look way too unbelievable. There wasn’t anything from this movie that stood out for me. It did give us a good lesson in life and maybe that’s what we need more of in our busy lives where people want us to live to their expectations. But in terms of an impactful sports movie, it falls short of the goal line there. I give this movie 2.5 stars out of five. It’s not a bad movie and I am sure most people will enjoy it. But it lacks the big truck stick to make it really last as a really strong football movie. 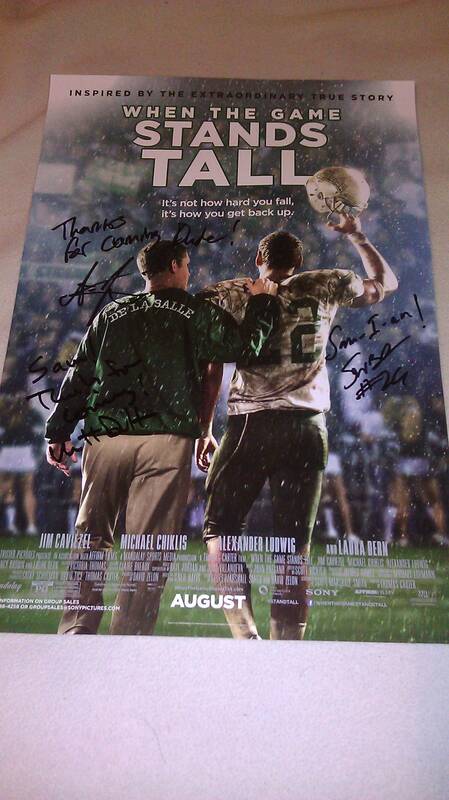 This entry was posted in Football, Movies and tagged When the Game Stands Tall. Bookmark the permalink.